Introducing the wonderful BELOW shop + Print giveaway! 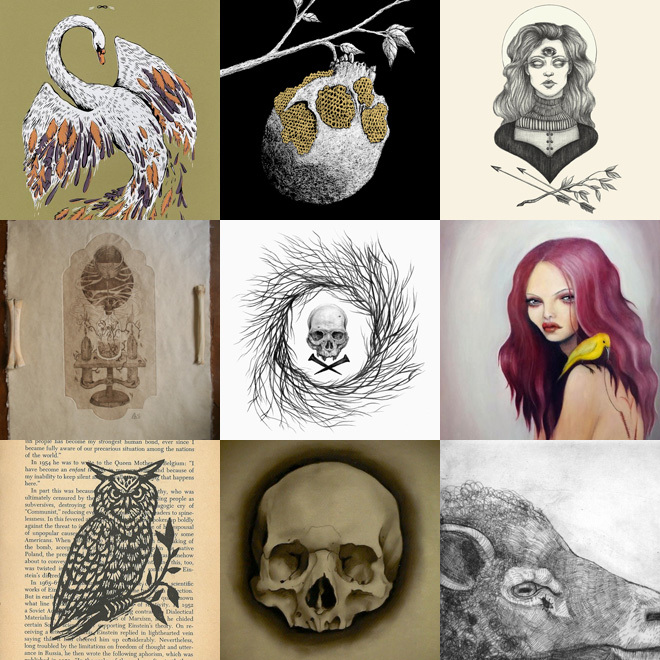 BELOW is a lovely curated online store where you can find all things gloomy. I was curious to learn more about Allison, her taste in art and, of course, BELOW. I’ve asked Allison if she’d be willing to share some insights with you here on Bleaq, so read on for more BELOW. At the end of the article you will also find out how to win the three art-prints. Enjoy! 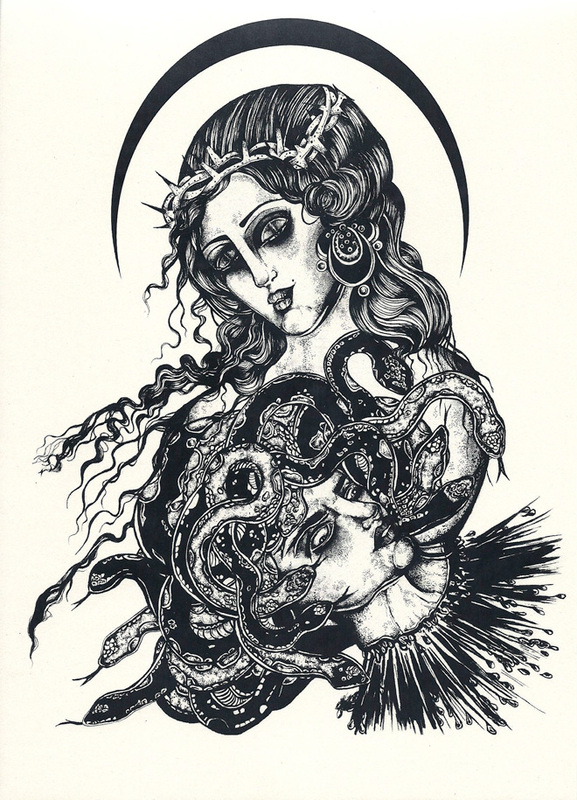 Bleaq: Hi Allison! Can you introduce yourself and BELOW in a few sentences? Allison: Hi! I am an artist/photographer as well as the owner/curator at BELOW. I enjoy listening to NPR and doom metal, hanging with my little family consisting of a boyfriend, dog, and cat, and working on BELOW. 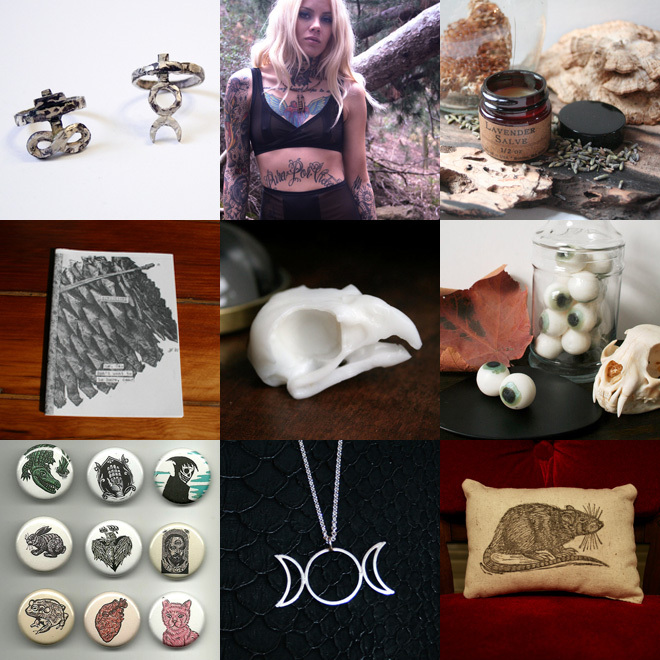 BELOW is an online shop, which features independent artists and makers from around the world who share in a dark and gloomy aesthetic. “Beautifully gloomy” is my short overall description for the shop. BELOW was born on All Hallows’ Eve last year. Can you share how the idea of the shop came to mind? Allison: BELOW has been a long time in the making. It’s gone through a lot of name changes, originally it was called Cooger & Dark, based off one of my favorite books, Something Wicked This Way Comes by Ray Bradbury, but I kept getting comical responses about cougars (the middle aged woman kind) which was not what I wanted people thinking about. Small shops and boutiques as well as art and handcrafted work have always been an obsession of mine and I knew that opening a shop would be my goal in life. So, BELOW was born out of my obsessions as well as my love for the dark and gloomy things in life. All Hallows’ Eve seemed an appropriate opening day. 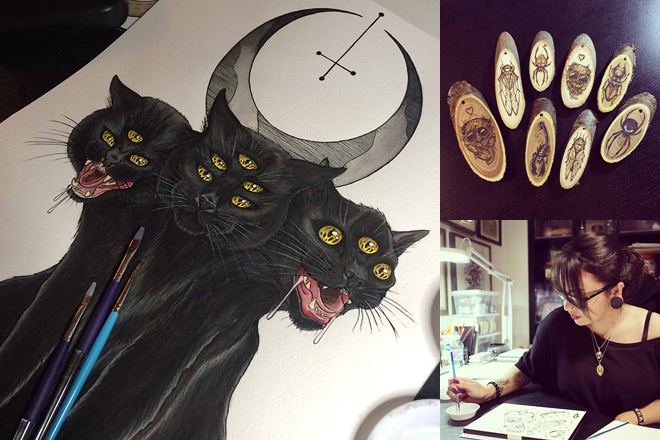 Through websites as BigCartel, Etsy and Society6 it’s easy for artists nowadays to sell their works to their fans. Is it hard for BELOW to compete with these personal shops, or does the broader range of products make shopping at BELOW a whole different experience? Allison: It has definitely been a challenge not only for sales but for artist participation as well. Although, BELOW doesn’t exist to compete with these shops. The goals behind BELOW are to create a sort of ‘one stop shop’ for all of these related artists and makers and also give them another outlet for sales and exposure. I like to think BELOW is more of a community than a business that’s trying to take over sales from the personal shops. So I hope it’s a bit of a different experience as you can purchase a little from everyone in one space. 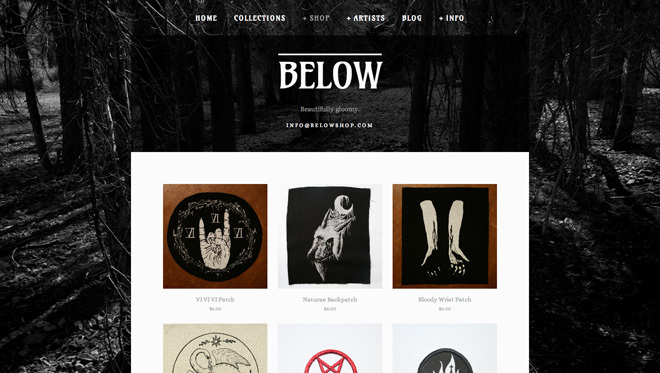 You released an exclusive BELOW collection a while back, called ‘As Above, So Below’. Can you share a bit about how this collection came to be, and the thoughts behind the theme? 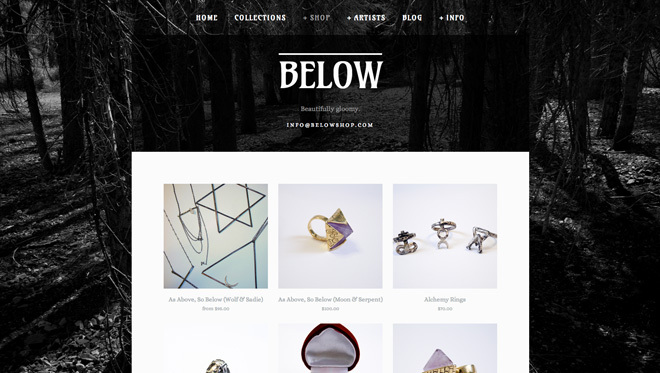 Allison: The ‘As Above, So Below’ collection is the first installment of another facet of BELOW. It’s a way to get artists involved more with the shop as well as inspire work that wouldn’t have otherwise been created. I want BELOW to be involved with creative processes and events, so the collection is the first idea that came to mind in order to move in that direction. 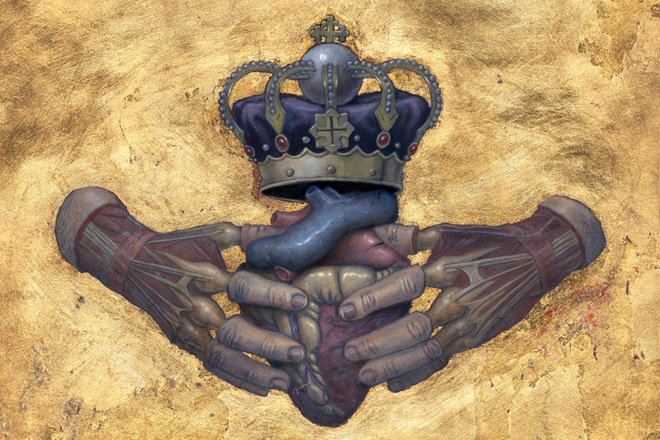 The saying ‘As Above, So Below’ was chosen because of its versatility as a theme since it can be interpreted in many ways depending on who is thinking about it. I am so stoked on every piece that has come in and so grateful for each artist who has participated so far! It’s probably an unfair question to ask a shop curator, but which pieces from your shop are most special to you? Why those pieces? Allison: hat is a hard question since I absolutely love everything in the shop and have specifically picked each piece because of that. But, the artists that I have been working with since before the shop even launched hold a special place because without them I would’ve opened an empty shop! Osteal was the very first artist to jump on board when I just had a mock up of a website and a description of what BELOW was going to be. 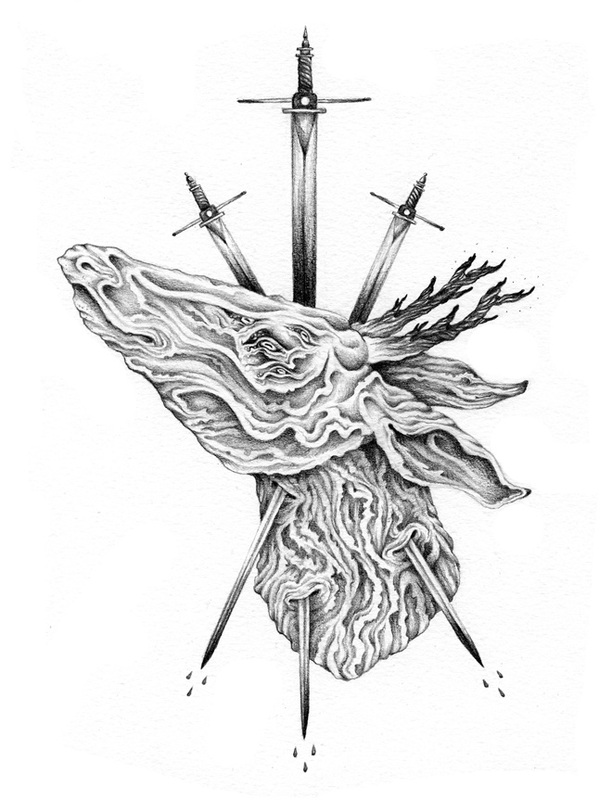 I launched the shop with work from Osteal, Horse & Hare, small ghosts, Natalie & Alanna, The Bower Studio, Lauren Gonsalves, Dylan Garrett Smith, Carol Roque, and Jas Helena. 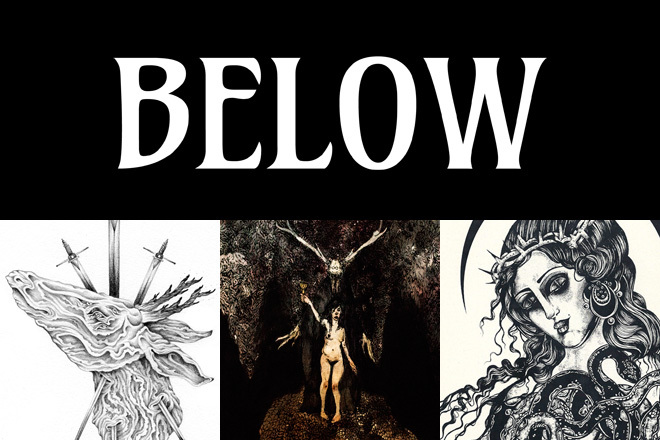 BELOW has a strong aesthetic view. Who are your personal favorite artists? Allison: BELOW definitely has a specific aesthetic that is hard to fully explain since ultimately it is based on what is visually stimulating to me. So really, the artists at BELOW are some of my current personal favorite artists within that aesthetic. I have a heavy background in photography as that’s what I studied in college. Huge inspirations for personal work are photographers such as Nan Goldin, Edward Weston, Lee Friedlander, Josef Koudelka, Robert Adams, Diane Arbus, Guy Bordin, Ellen von Unwerth… I could go on forever with this list. Street art is really important to me as well and I was in heaven and weirdly emotional seeing work from my favorites such as Roa, Neckface, Barry McGee, Os Gemeos, and Swoon at the Art in the Streets exhibit at MOCA in 2011. I could go on and on with this answer but I’ll leave it at that! With many social networking websites it’s almost too hard to keep track of everything. Social networks can be very important to promoting a shop though. Where can we find BELOW on the internet and how important are social networks for you and your shop? Allison: You can find BELOW on Instagram, Facebook, Tumblr, and Pinterest. Social networks I think are important for anyone with a business. It’s free advertising as well as this amazing way to actually interact with customers and gain a lot of great feedback on what you’re doing. I personally manage all of these accounts and love that I can see what the artists I am working with are up to and be able to put a little more personality behind BELOW rather than just ads and a website. Allison: I just watched Her the other night and I loved it, it’s a gorgeous movie and perfectly sad and happy at the same time. I also saw Coherence recently and that movie really messes with your head but it was great. I just did a post about Marcin Ryczek on Tumblr and am a little obsessed with his images as they’re reminiscent of the classic photographers I have a lot of love for. Most recently though I’ve been catching up on TV shows like Orange is the New Black, The Walking Dead, Sons of Anarchy, American Horror Story, and I’m a late comer to watching Twin Peaks but I think I’m three or four episodes in right now. Oh, and if you haven’t watched True Detective, get on that. 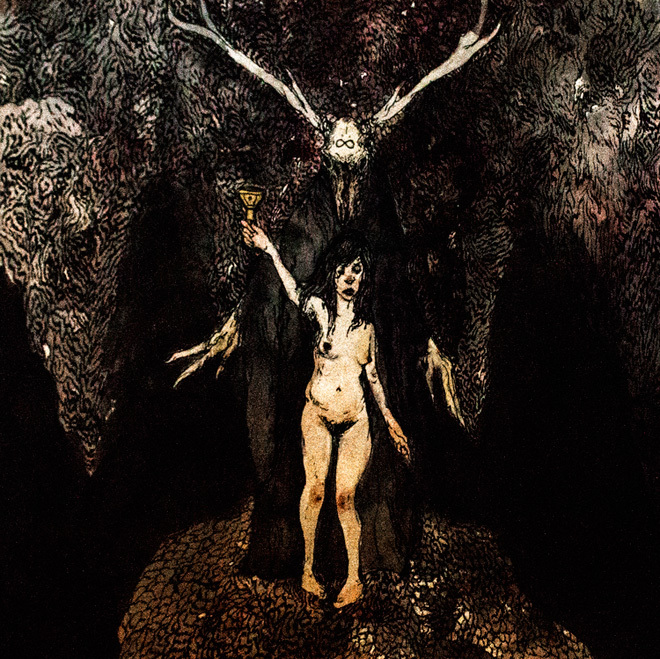 Bleaq: I second that: Twin Peaks & True Detective are a must-see! Thanks to Allison for telling us a bit more about herself and BELOW! P.S. You can also still enter in the competition to win The Book of Skulls! Learn more on how to make a chance on this book here. Lovely interview & completely inspiring! Wow, a new shop I didn’t know about! Too bad that the giveaway is only on Instagram. Ah, well, maybe some other time.